The Australian Football League (AFL) is the national competition of Australian Rules football. Melbourne is its undisputed focal point. 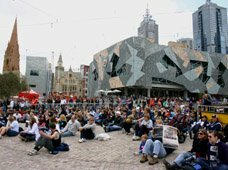 Melburnians love their sport and are known to be ‘footy mad’. The footy season runs from the end of March to September when 17 teams play against each other in 24 rounds. These matches are followed by the finals, where the top 8 battle for a place in the Grand Final. The AFL Grand Final is the final play off between the top two teams. It is the best attended domestic club championship event in the world, with nearly 100,000 attending the game at the MCG. 10 of 17 AFL teams are from the greater Melbourne area. Sydney, Brisbane, Adelaide and the Goldcoast have one each, and Western Australia has two. The reason that the Australian Football League is a ‘Melbourne thing’ is that it evolved from the VFL, a Victorian competition. Its first season was played in 1897. It only became a national competition in 1989. The majority of Melburnians - at least nominally and many activley - support a footy team. It is a family thing and friendly, with footy tipping going on in schools and work places. You can recognise the tribes of supporters by their team coloured scarves, hats and jackets. Often you get whole family taking off to their local game on the weekend. The AFL is the most attended professional sporting league in Australia, with an average attendance of over 36,000. It is the third highest of any sports league in the world (behind American Football, and nearly on par with German soccer attendances). 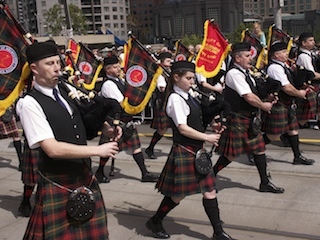 Even we, who have never been a fan of spectator sports, have fun at times being around the spirit of play that surrounds this spectacular – and you really cannot escape it if you are in Melbourne during the season. To experience a 'footy' game you can also take an Australian Aussie Rules Football Tour with a live local guide. He will walk you through experience and explain the rules, bumps and brawls of this unique game. The Australian Football League Grand Final has become Australia's most important sporting event. It is held in the Melbourne Cricket Ground (MCG) late September. The winner is the annual AFL premiership champion. The 8 highest-ranked teams of the premiership participate in a four-week tournament, with two teams eliminated in each of the first three weeks. The elimination system used, gives the top four teams an easier road to the Grand Final by giving them the advantage of home games. The annual premiership champion is decided at the Grand Final. The finals week is spectacular, not just in the MCG, but throughout the city. 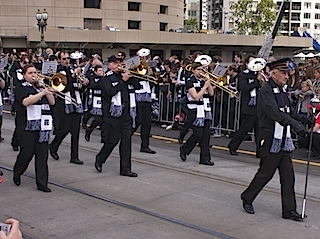 The traditional Grand Final Parade, held Friday lunchtime before the Grand Final, features players and mascots from the competing sides parading the main streets of Melbourne. Regularly over 30,000 fans and onlookers pack the sidewalks for a glimpse of their favorite players. The final TV Footy Show features live in the Rod Laver Arena on Thursday night before the Grand Final. There is an attractive mix of live music performances, and footy stars dropping their shorts and playing dress-ups in the annual player’s revue. The most successful team in the Australian Football League premiership has been Essendon, with 16 Grand Final wins, and a total of 30 Grand Final games played. They are closely followed by Carlton, who have also won 16 Grand Finals, with a total of 29 Grand Final games. However, many of their fans have lost heart in them – their last Grand Final victory was in 1995. The next team on the tally is Collingwood, with 14 victories and an amazing number of 39 finals. 2009, Geelong returned as the unbeatable champion beating St Kilda, whose hopes for a Premiership had been high. 2010, Collingwood- decided a week late after a replay because of a draw. Finally a premiership after 20 years, with St Kilda coming second best yet again. 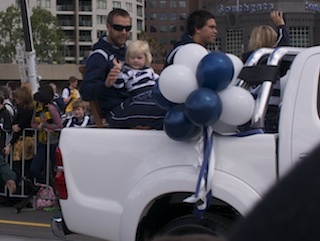 2011, Geelong did it again, and turned out to be not too old or too slow to beat Collingwood! 2012, Sydney Swans beat Hawthorn, who nearly made it again. Here is a full list of AFL premiership champions. Return from Australian Football League to Melbourne Home Page.